Kayaking is a great way to see Florida’s best waterways! As you read about outdoor fun in Florida, a common theme emerges: water. Florida is blessed with beautiful springs, remote lakes, coastal estuaries, shallow ocean fishing sites, rivers, creeks and streams. And one of the best ways to experience all the outstanding natural waterways in Florida is by kayak. Florida is home to miles and miles of some of the most beautiful waterways you will ever find, all accessible by kayak. What better way to experience wildlife than to silently float near alligators, turtles, fish, manatees and birds, quietly clicking away with your camera? There are numerous kayak/canoe outposts found on Florida waterways that offer rentals and all the equipment you will need. A quick bit of instruction from your renter is all you will need to get started. The paddling required to move the kayak along is minimal and within minutes you will be gliding into viewpoints you’ve never experienced before. Many of the vendors will even drop you off upstream and pick you up downstream, depending on what you want to see. A good resource for planning a kayak adventure is ClubKayak.com, a paddlesport community for kayaking and canoeing. On their website you will find paddle clubs all around the state organized to provide weekly trips. Members enjoy overnight trips, meetings, social events, biking, hiking, fishing and more. 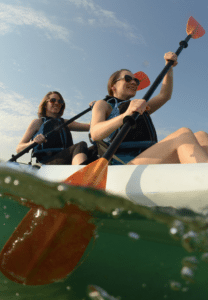 Groups on ClubKayak include the Florida Sea Kayaking Association, the Green Wave Forum and many local clubs from cities and counties all around the state. Paddle Florida calls Florida a paddling paradise, with 45 designated trails, 1,000 miles of coastline and more than 1,700 miles of rivers, streams and creeks. Great lists of paddling destinations are organized by region at www.paddleflorida.net. John Pennekamp Coral Reef State Park, Key Largo: First underwater park in the U.S. covers 70 square miles. Easy access to the only living coral reef in the continental U.S.
Myakka River State Park, near Sarasota: Explore the Myakka River, a designated Wild and Scenic River flowing for 58 miles through wetlands, prairies and pinelands. Cayo Costa State Park, Fort Myers: One of the largest undeveloped barrier islands in Florida, including nine miles of beautiful beaches and mangrove estuaries. Grayton Beach State Park, Destin: Kayakers can get a close look at the salt marsh ecosystem on scenic Western Lake in this nearly 2,000-acre park that includes one of the most pristine beaches in the country. Anastasia State Park, St. Augustine: Miles of pristine beach, tidal salt marsh and upland hammocks to explore. 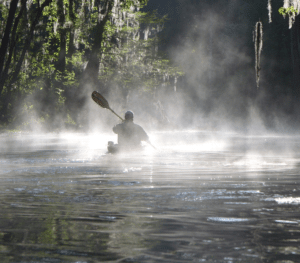 Silver River State Park, Ocala: Paddlers can enjoy the Silver River in sections or the entire 5.4 miles via a couple of launching points within the park: at the headwaters just south of the main spring or at the end of the River Trail. Collier-Seminole State Park, Naples: Temperate and tropical plant communities including one of three original stands of royal palm trees in Florida can be seen as you paddle the Blackwater River into the bay and Ten Thousand Islands. Hillsborough River State Park, Tampa: A mecca for birdwatchers along the Hillsborough River, featuring rosette spoonbills, heron, ibis and even a few large alligators. Bahia Honda State Park, Key West: Watch the sun rise over the Atlantic and set over the Gulf of Mexico, all from your campsite. clear waters so close to Orlando.